Thankful for a good night’s sleep, we got up at 5:15 am and took a long, hot shower. Now, if you’ve never done the Camino de Santiago before, this probably doesn’t seem like a big deal. However, since pilgrims carry all their gear in a backpack, absolutely no one showers in the morning – otherwise, his towel would be wet and could not be packed with the rest of his gear. As we headed past the Church of Our Lady of Carmen, we were equally happy to see the presence of lights and absence of teenage PDA. Still, this would be our last clearly lit path for the next hour and a half. Mikey took this picture with the flash on his iPhone. Yeah, just like international roaming, it is a setting that one permanently turns off before arriving in Europe. But, as there was absolutely no other light on the path (save his dim mini-flashlight), this was a one-off photo-op. This is why. 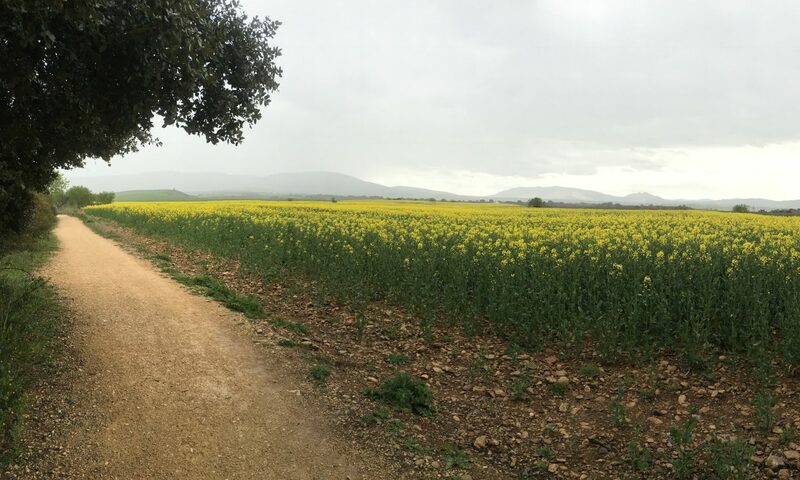 In the 42km between Villafranca de los Barros and Merida lies nearly 30km of straight Roman roads. Although the stones have largely been repurposed, the dirt and gravel paths are maddeningly straight with little to see but farmland. Oh, and we don’t mean pastures with little piggies or cows or crazy goats. Nope, on both sides of the path exist only vineyards. OK, there were some with a bit more growth, but the real beauties show off closer to harvest time in September and October (this is also the hottest time of the year). As such, by leaving an hour and a half before daylight, we cut out 7km of sheer visual monotony. Yep, it’s called put in the earbuds, shine the flashlight just ahead, and tune out in the darkness. Oh, but we are omitting Mikey’s complete inability to focus on his audiobook as every single ghost story and scary movie he ever saw as a child kept replaying in his mind for the whole hour and a half of waiting for the sun to rise. Yes, Bram Stoker – WE GET IT – darkness is terrifying! There is a little town about 15km before Mérida that one would normally pass through without a second thought. If ever you are in Torremejia, please try the local rosé wine. It is truly the best part of this town. At long last, we crossed the Lusitania Bridge and entered the city. All jokes aside about it not sinking, Lusitania was actually the name of the Roman province that encompassed a large part of Portugal and almost all of Extremadura. But, and more important to our story, we were on the wrong bridge! Mikey doesn’t want to admit it, but we took a wrong turn and ended up viewing from across the water (instead of walking over) the Roman bridge that enters Mérida. At 790km, it is the longest intact Roman bridge in the world and (as such) we’ll probably have to walk it at some point! But, we were more interested in dinner since the entire day had been dedicated to getting here. What we thought was a simple salad, hamburger, and dessert ended up being quite the presentation. Even the cheese on the salad was done as fried cheese balls! Let’s just say, if even in Mérida, check out La Catedral Restaurante. We also checked out a church in the main square, but it was closed. This Holy Week Confraternity statue reminded us that it had been a very long day, so we made a somewhat circuitous way back to the hostel for a prolonged soak in the private bathtub and an abbreviated evening of Discovery Channel before passing out in a double bed! (Small joys after many nights on twin bunk beds.) See you tomorrow for the Grand Tour!